An individualized program designed by a heath care professional to return clients back to work, sport and daily activities. Following a thorough assessment by one of the Physiotherapists or Chiropractors a treatment plan consisting of Kinesiology sessions will be devised. Sessions will take place 2 to 5 days per week for 30 minutes to 2 hours. The goal is to ensure our clients receive the knowledge base and tools to continue at home or gym and avoid future injuries. The program is open to all clients who would benefit from an active approach to injury rehabilitation, including those that have sustained a motor vehicle accident (ICBC Claim) or work place injury (WCB Claim). 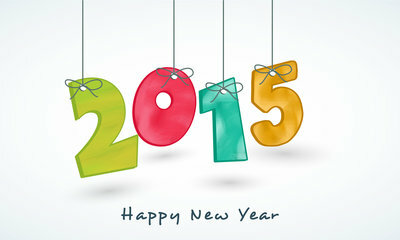 Happy New Year from all of us at Moveo! We hope that you had a great Holiday season and we would like to thank you for your patronage in 2014 and for choosing us for all your rehabilitation needs! We look forward to continuing our relationship in 2015! Have you been wanting to try a new service at Moveo? Do you have a friend or co-worker that would benefit from our services? If yes, this promotion is for you. 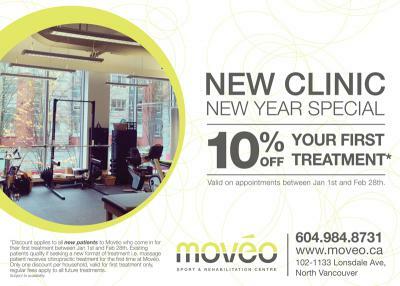 Book your initial visit and come in before Feb 28th and receive 10 % off! Happy New Year! 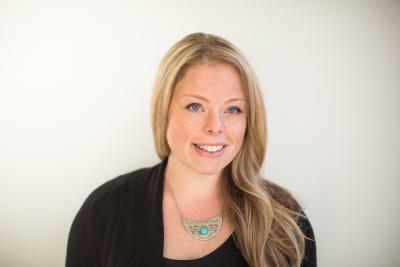 Shayla Hall is the newest member of the Moveo Team. She’s a registered physiotherapist and acupuncturist. We sat down with Shayla to get to know her better. I love helping people see the resiliency of their bodies – helping them move from a place of stress and anxiety about an injury into a place of understanding and empowerment. I love knowing that people leave the clinic feeling better than when they walked in. If you didn’t work at Moveo, where would you be today? Hobnobbing somewhere in the Sea to Sky corridor. What types of clients would you most like the opportunity to work with at Moveo? Variety is the spice of life, right? I like working with all sorts of injuries and issues, but of course kind, fun and motivated clients make my job a pure joy. My treatments are very hands-on. My goal in the clinic is to release blockages and restore movement so clients can get back to doing the things that inspire them, whether that’s running a marathon, lifting their baby or living without pain. 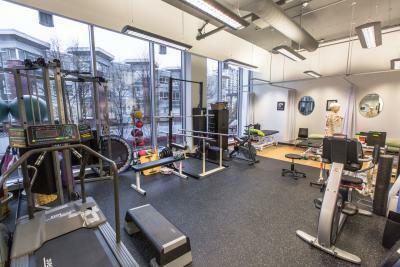 Following a history and assessment, an individualized treatment plan consisting of kinesiology sessions will be devised. The program is open to all clients who would benefit from an active approach to injury rehabilitation, including those that have sustained a motor vehicle accident (ICBC Claim) or work place injury (WCB Claim) to athletes looking to return to sport. Paired training is available, inquire for details. We are discussing headaches and how Moveo can help. The brain itself does not contain nerves that are responsible for pain sensations – which means the brain tissue itself can’t “hurt”. The actual pain of headaches originates in structures or tissues in the surrounding regions of the brain and, therefore, a headache typically signals an issue in the body that needs to be addressed. Most headaches can easily be treated with over the counter pain relievers (e.g., aspirin, acetaminophen, ibuprofen), but chronic headaches may require a more therapeutic approach, especially if the headaches may be the result of pain referred from the body (e.g., neck or upper back pain). In such cases, our practitioners can help individuals address the cause of the headaches, and in doing so, reduce their occurrence. If an individual is suffering from tension headaches, for example, therapy may involve teaching the person relaxation and coping strategies that can be used when stressful situations arise that have been found to be the triggers for their headaches. If it is believed that body pain (e.g., shoulder or back pain) is causing the tension headaches, then we would more than likely focus on relieving muscle tension as well as teaching an individual stretching and strength-training exercises. Once we feel as if an individual has learned how to properly perform the exercises, they can then be incorporating into a home exercise program, or easily done while at work. Individuals who continue to engage in their exercises generally experience relief from headaches and body pain. Furthermore, the therapeutic techniques can become a long-term approach to avoiding the headache triggers, stopping a headache if it does start, or reducing its intensity and frequency. If you are experiencing chronic headaches or even neck, shoulder, or back pain that you believe may be associated with the occurrence of your headaches, our trained professionals at Moveo can show you stretching exercises and various treatment methods that have proven to be useful. Neck and shoulder training, in particular, has been shown to reduce both headaches and body pain. Furthermore, some of the techniques can even be performed at the workplace. We at Moveo would be happy to assess your current physical state and create a program tailored specifically to your needs and goals. Call Moveo to make an appointment or to ask any questions you may have. Williams LA. A concise discussion of headache types, Part 1. Int J Pharm Compd. 2012; 16(2):125-32. Amiri M, Jull G, Bullock-Saxton J, Darnell R, Lander C. Cervical musculoskeletal impairment in frequent intermittent headache. Part 2: subjects with concurrent headache types. Cephalalgia. 2007; 27(8):891-8. Abaspour O, Javanshir K, Amiri M, Karimlou M. Relationship between cross sectional area of Longus Colli muscle and pain laterality in patients with cervicogenic headache. J Back Musculoskelet Rehabil. 2014; in press. Fernández-de-Las-Peñas C, Ge HY, Alonso-Blanco C, González-Iglesias J, Arendt-Nielsen L. Referred pain areas of active myofascial trigger points in head, neck, and shoulder muscles, in chronic tension type headache. J Bodyw Mov Ther. 2010; 14(4):391-6. Gram B, Andersen C, Zebis MK, Bredahl T, Pedersen MT, Mortensen OS, Jensen RH, Andersen LL, Sjøgaard G. Effect of training supervision on effectiveness of strength training for reducing neck/shoulder pain and headache in office workers: cluster randomized controlled trial. Biomed Res Int. 2014; 2014:693013. As of November 2014, Moveo has introduced online booking! Available 24 hours a day, 7 days a week! 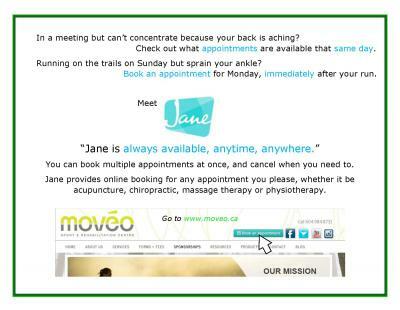 Visit www.moveo.ca to book an appointment at your convenience. To celebrate our new clinic and the beginning of 2015, we’re offering 10% off for first time treatments. If you know someone who is in need of bodywork to help them start the new year off right, tell them to give us a call!